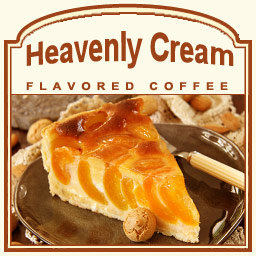 The Heavenly Cream flavored coffee is a gourmet treat that will taste like a little piece of Heaven. With a sweet Amaretto aroma and a vanilla butter cream flavor, the 100% Arabica coffee beans in this Heavenly Cream coffee create a sweet and dreamy flavor creation. For those looking for a fluffy flavor that will linger in your mouth well past the last sip, the Heavenly Cream will take you to your coffee heaven. Sent in a heat-sealed valve bag, your Heavenly Cream flavored coffee will be the freshest coffee possible � especially since it is roasted and shipped on the same day. Creamy with vanilla butter cream, this Heavenly Cream will soothe your coffee loving taste buds!